We arrived around 8 am in Lier, village where Grete lives. Another great friend we met in DPRK. She welcomed us with a great breakfast…… I should not forget to mention that we both had a good shower at Grete’s place before we left to see Drammen city. It is luxury to have a big bathroom after travlling in the motor home for more than 2 weeks now. We had hot water and separate toilet and a shower in our vehicle, but ……. 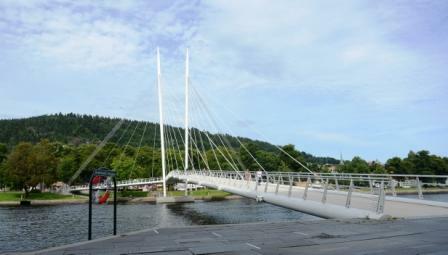 We went to Drammen at around noon. We first took the Spriralen ( a tunnel which goes up a hill in a spiral shape) This is an experience. We arrived in a recreational area… lots of green, foot paths, and sitting areas….. We climbed down the hill half way to arrive at the observation deck, where there is a restaurant as well. 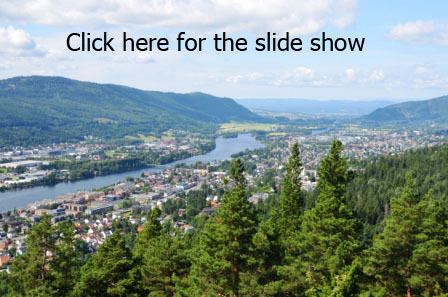 Even though the restaurant was close at that time, we enjoyed quality time being in the nature overlooking the Drammen valley and Drammen river. Then we drove to the city centre. Bragernes torg, the market place. Nice little city with a lovely main market square surrounded by lots of nice restaurants. We had lunch at Pegen restaurant. Very nice food… we recommend the place for you all if you decide to visit this nice little town 30km away from Oslo, to avoid the hazel of the capital to a calm green small city nearby. We then went to see the Ypsilon Bridge, famous bridge in Norway, we also saw Papir Bredden: the area where in the past there were lots of paper factories. After buying the necessary food stuff to prepare a traditional Norwegian dinner, Grete guided us back to her place. We sat in her garden drinking white wine and chilling a little bit. The off went Grete to the kitchen, when I went to check on her, the salmon was already in the foil with the carrots, spring onions, garlic, charlottes, olive oil and white wine…… in few minutes she boiled potatoes, prepared the Fennel salad and boiled asparagus……. All in a special way.. Special sources and special dressings…. We sat for dinner around 8 30pm……wooooooooooooooow what a dinner……. Superb Norwegian dinner cooked with love by a good friend.. what more can a traveler expect……..